Ryō Horikawa (堀川 りょう, Horikawa Ryō, born Makoto Horikawa (堀川 亮, Horikawa Makoto), born February 1, 1958) is a Japanese actor and voice actor from Osaka. He is married to fellow Japanese voice actress Hitomi Oikawa since 1988, whose birth name is also Horikawa (堀川). His former stage name is also Ryō Horikawa (堀川 亮, Horikawa Ryō), which uses the kanji of his given name, though pronounced "Ryō". He is best known for his role as Vegeta from the Dragon Ball series, Reinhard von Lohengramm from Legend of the Galactic Heroes, Andromeda Shun from Saint Seiya, Heiji Hattori from Detective Conan, and Captain Falcon in the Super Smash Bros. series. Horikawa started out as a child actor in elementary school. He made his debut in voice acting as Kenta Hirono, the protagonist of the 1984 anime Dream Soldier Wing-Man. 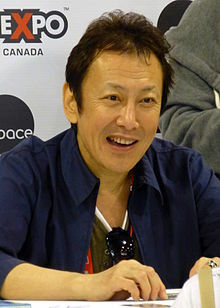 From there, he became famous for his anime character roles as Andromeda Shun (Saint Seiya), Reinhard von Lohengramm (Legend of the Galactic Heroes), Vegeta (Dragon Ball series), and Heiji Hattori (Detective Conan). He is also well known for his game role as Captain Falcon (Super Smash Bros. series). His wife is also a voice artist. He is also a fluent English speaker. ^ "Interview: Ryo Horikawa (Voice Actor, Dragonball Z)". inside.anime-expo.org. Anime Expo. 2012-08-30. Archived from the original on 2015-01-06. ^ a b c d e f g h i j k l m n o p q r s t u v w x y z aa ab ac ad ae af ag ah ai aj ak al "声優さん出演リスト 個別表示：堀川りょう(Ryou Horikawa) [Voice actor's appearance list individual display: Ryō Horikawa". Voice Artist Database (in Japanese). GamePlaza-HARUKA. Retrieved April 17, 2017. This page was last edited on 17 April 2019, at 05:52 (UTC).